I am working on a new website for the film "Strandbeesten". I am sorry that you are not able to see video or photos at the moment. They will follow in the next days. Here you will find all the articles I wrote during the last seven months. The idea of this webiste is to share my work, my ideas and the experiences with you. I am looking forward to your opinion. Happy New Year! Today I start to work with the footage. We have so many hours of footage. And my first job is to find a way to put all the files in order. 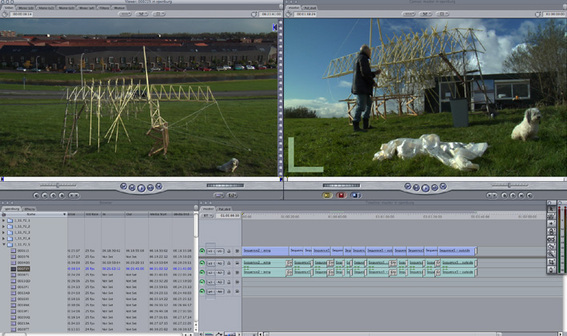 We have 720p footage shot with the Panasonic in October and the 1080i material we shot in London. And some archive footage that was shot on Super16 in 2003 and 2004. I will do the first rough cut on an new intel iMAC with Final Cut Pro 5.1.2. And we have to find a way to share my work with Marcio and Stefan.